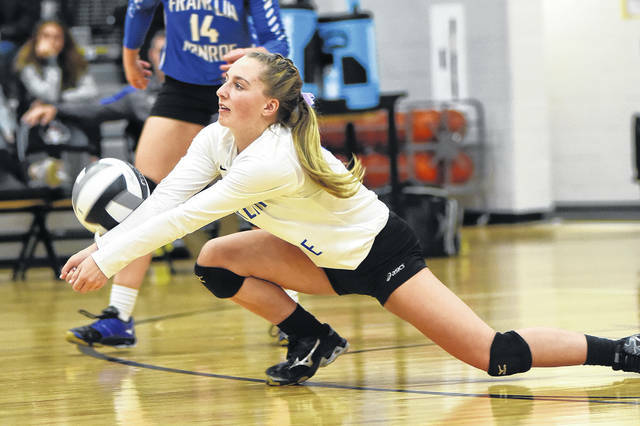 Franklin-Monroe’s Belle Cable goes down to the floor for a dig on Wednesday night during a Division IV sectional finals match against Fort Loramie. The Lady Jets lost to the Redskins in three sets. 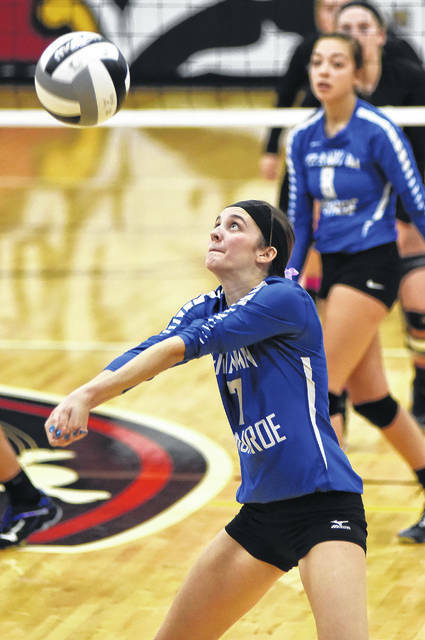 Franklin-Monroe’s Brigette Filbrun sets the ball up for a teammate on Wednesday night during a Division IV sectional finals match against Fort Loramie. The Lady Jets lost to the Redskins in three sets. Franklin-Monroe’s Chloe McGlinch hits one just over the outstretched arms of the Fort Loramie defenders on Wednesday night during a Division IV sectional finals match. The Lady Jets lost to the Redskins in three sets. Franklin-Monroe’s Chloe Peters smashes the ball back toward Fort Loramie on Wednesday night during a Division IV sectional finals match. The Lady Jets lost to the Redskins in three sets. 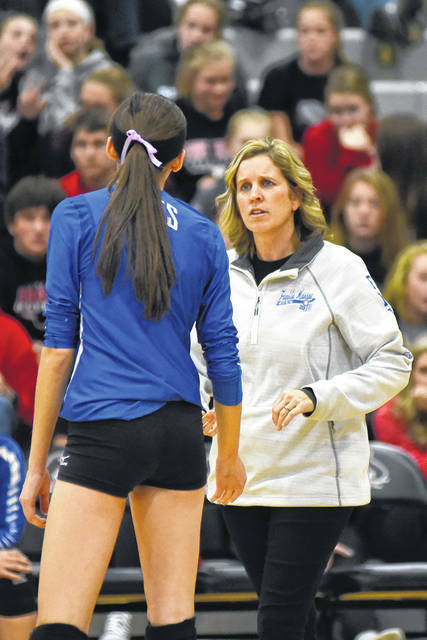 Franklin-Monroe coach Angie Filbrun talks with her daughter Brigette during a Division IV sectional finals match against Fort Loramie on Wednesday night. The Lady Jets lost to the Redskins in three sets. 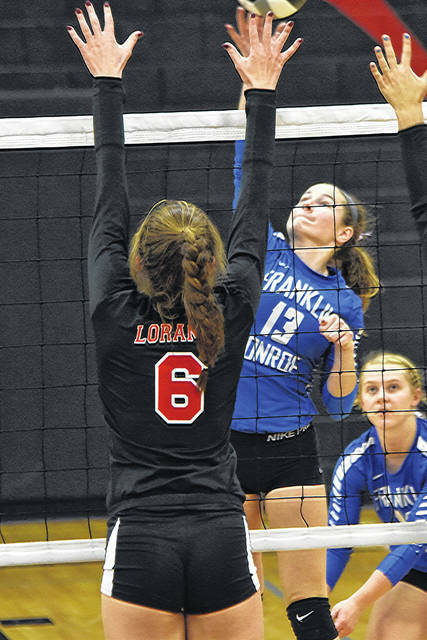 Franklin-Monroe’s Corina Conley smashes the ball back toward Fort Loramie on Wednesday night during a Division IV sectional finals match. The Lady Jets lost to the Redskins in three sets. 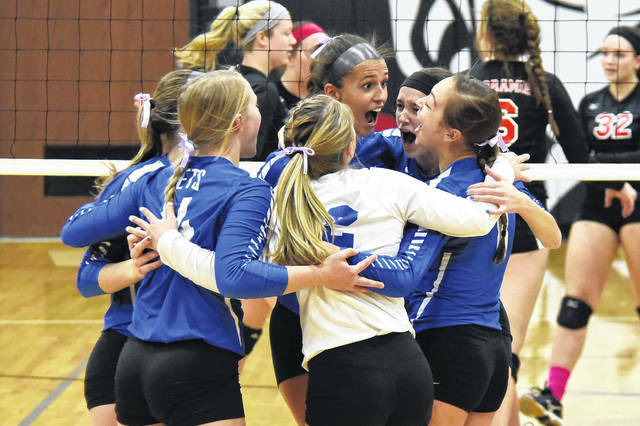 Franklin-Monroe celebrates a point against Fort Loramie on Wednesday night during a Division IV sectional finals match. The Lady Jets lost to the Redskins in three sets. Franklin-Monroe’s Janessa Koffer sets the ball up for a teammate on Wednesday night during a Division IV sectional finals match against Fort Loramie. The Lady Jets lost to the Redskins in three sets. 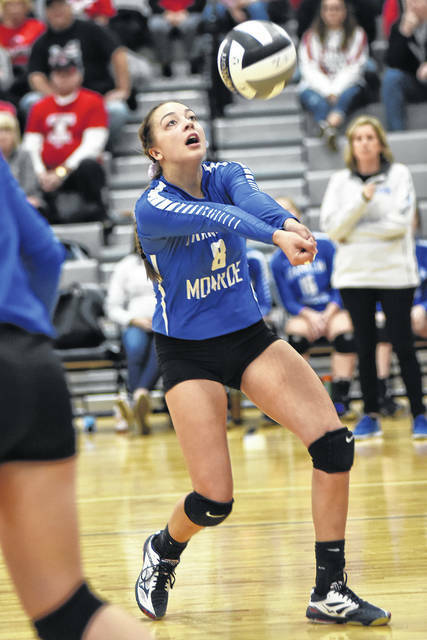 Franklin-Monroe’s Kennedy Morris sets the ball up for a teammate on Wednesday night during a Division IV sectional finals match. The Lady Jets lost to the Redskins in three sets. 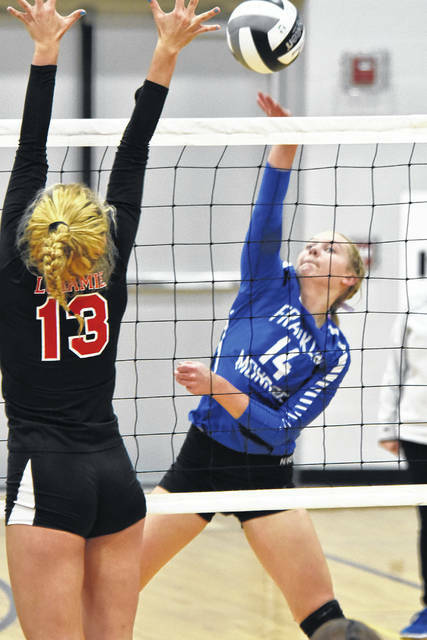 Franklin-Monroe’s Kloe Zink smashes the ball back toward Fort Loramie on Wednesday night during a Division IV sectional finals match. 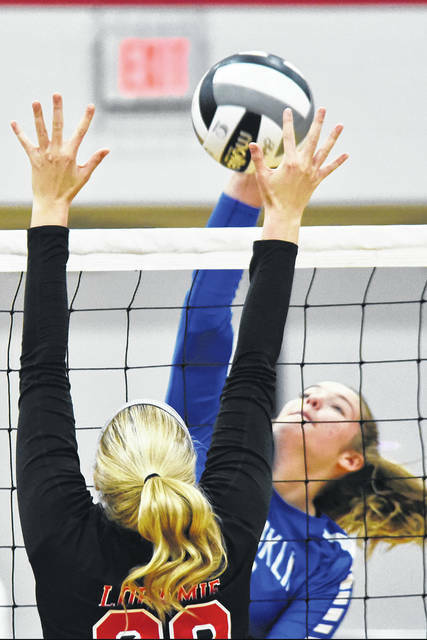 The Lady Jets lost to the Redskins in three sets. 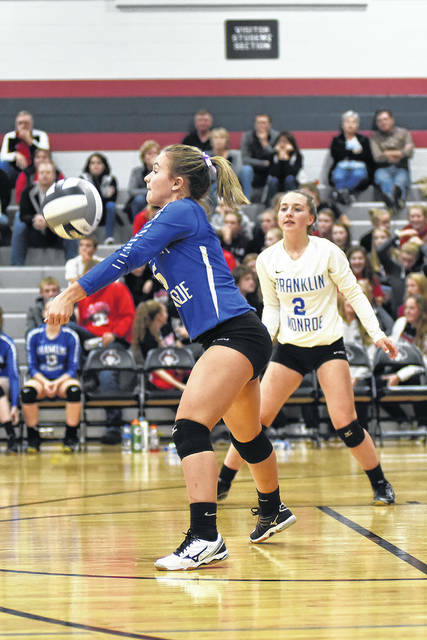 COVINGTON – The Franklin-Monroe volleyball team came up against a strong Fort Loramie team in the Division IV sectional finals game on Wednesday in Covington. On a full ‘Hunters’ moon night, the Redskins captured the sectional title in a 3-0 sweep of the Jets. The last time the Jets went to a sectional final was eight years ago. The surreal moment of the season ending was hard to put into words for Franklin-Monroe coach Angie Filbrun, not only because her team lost, but also for the fact that not only was she a coach, she was a mom and had to say good-bye to two seniors – Kennedy Morris and her daughter Brigette Filbrun. In the opening set, Fort Loramie had a slim 7-6 lead and then went on a 6-point run before the Jets broke them trailing 13-7. Franklin-Monroe was never really able to generate any offense and played on their heels dropping the first set 25-17. “Their offense was so quick, and our middles just couldn’t keep up, so we were playing defense the whole time, it’s hard to score and win like that,” Filbrun stated. In the second set the Jets got down 14-3 and in that stretch Fort Loramie had four serves hit the net and just drop over for scores. Everything was rolling the ‘Skins’ way. 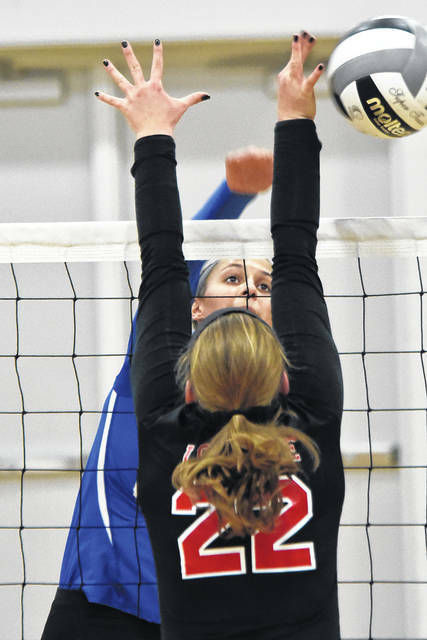 The Jets rallied closing the gap to 16-12, but the deficit was too much to overcome as Fort Loramie pulled out set two 25-16. Trailing 20-12 in the third set FM coach Filbrun called a timeout to talk to her team. “I told the girls in that last set our goal was to leave it all on the floor and that we were going to get to at least 20 points and go down fighting,” Filbrun commented. That is exactly what the girls did as they responded with a spirited effort before falling 25-20 in the final set and the match. She also wanted to recognize the great support for her team as well. Franklin-Monroe’s season ends with a fine 20-5 overall record and a third-place finish in the Cross County Conference at 10-2. “It’s so hard to say farewell to our seniors and this team. I really loved coaching them,” Filbrun concluded.